Most of Nepal love their very own Choila, which is grilled (buffalo) meat dressed in spicy oil seasoning. Choila (also spelled Chwelaa) is a classic Newari dish from Nepal usually paired with crispy dry flattened (or beaten) de-husked rice, known as Chiura in Nepal and Poha in other parts of Indian subcontinent. The spicy oil seasoning of the grilled meat is partially soaked up by crispy flattened rice. The resulting bite is crispy flattened rice texture with the texture of grilled meat. Bobby Flay captures this texture in crunchified burger by adding crispy potato chips on grilled burger meat. Nepal also love Wai Wai, a Thai brand of instant ramen noodle — now the most popular packaged food in Nepal. Wai Wai is sort of Nepal’s naturalized national dish that changed eating habits of people – shifting source of food ‘out of earth’ to ‘out of plastic wrapper’. People eat Wai Wai as a ramen soup or just by itself as a snack. 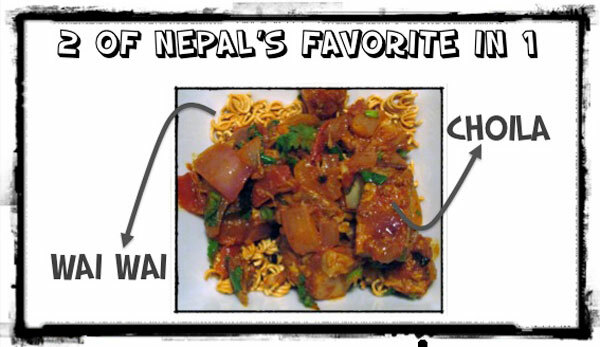 How about combining Nepal’s indigenous dish with its naturalized dish? Here’s my quick snack of Choila served with slightly crushed Wai Wai. Here, Wai Wai substituted the crunchy flattened rice, Chiura. PS. I have to admit that this dish was created out of necessities of me not having any access to flattened rice the evening I was making grilled choila.